Should pluralism an important value for religious conservatives? And if so, why? In a really thought provoking interview with the author of Confident Pluralism: Surviving and Thriving through Deep Difference, Al Mohler today explored the necessity and limits of pluralism, and the forgotten right of assembly. In the interview, Mohler asked some probing questions of the author, Professor John Inazu, Distinguished Professor of Law and Religion at Washington University in St. Louis. They discussed the tradition of pluralism in America’s past, which showed itself mostly as the recognition of the need for acceptance between different varieties of Christianity in the colonies – I say “recognition” because, though this was done in principle, it was often NOT done in practice. But pluralism protects all of us from those who are in power. The problem, however, is that since Christianity has been in cultural power for so long, we have neglected and forgotten the virtues of pluralism until now, when we find ourselves becoming a minority. While this is understandable, it is not good. Inazu mentioned three virtues, but Mohler took issue with the third, demanding a clear definition, which was very instructive. Here’s my take on these three virtues and their role in our approach to public policy. Christians should have no problem affirming the value of humility (even if we don’t practice it near enough). But in what sense? In the sense that we must admit that even when in the majority, we honor the participation of all members of our society rather than allowing the majority to steamroll over everyone. Often, valuing the input of minorities will also benefit us when we become the minority. 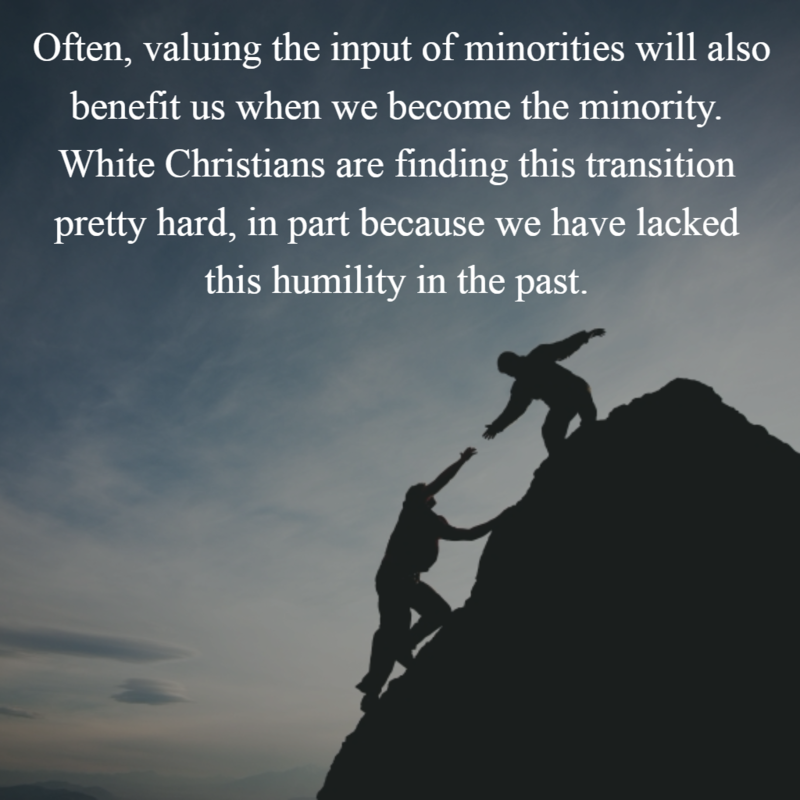 White Christians are finding this transition pretty hard, in part because we have lacked this humility in the past. Better to awake to it now (when it is self-serving) than never, I suppose. This additional Christian virtue is a call to civility, patience in winning the hearts of people before we use our influence to force legislation through. Winning the public debate before the legislative one is a patience that most modern people and politicians lack. This doesn’t mean waiting for unanimity, but it does mean that if we only pass bills based on a partisan majority without any meaningful compromise or buy-in from the opposition (such as with the 100% partisan passage of the ACA), we are not exercising the virtue of patience, but are essentially bullies. If we want a more amiable society, we need to learn to discuss critical matters in a civil matter, and not rush to public policy by winning votes witnout winning public sentiment. Interestingly, tolerance is not a virtue elucidated by Christianity, and when conservatives hear this word, they think of the false equivalencies pushed by multiculturalists. When pushed on what this meant, Inazu defined both what it should be, and the extremes that it is not. 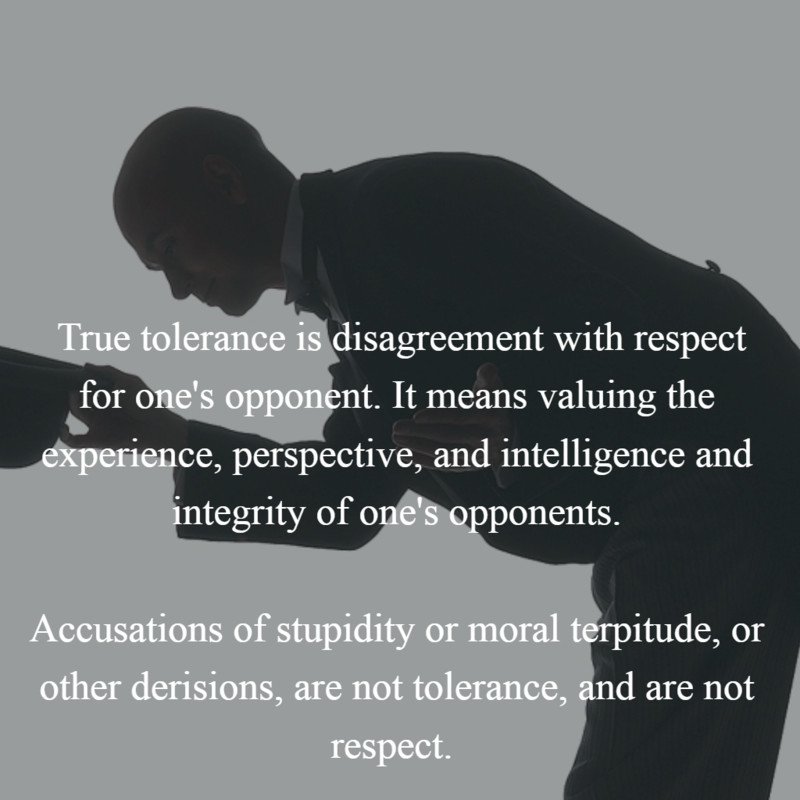 True tolerance is disagreement with respect for one’s opponent. It means valuing the experience, perspective, and intelligence and integrity of one’s opponents. Accusations of stupidity or moral terpitude, or other derisions, are not tolerance, and are not respect. However, this does not mean that all opinions or positions are of equal value or truth. Tolerance need not be reduced to relativism. It may mean pressing forward respectfully, agreeing to disagree, and keeping the lines of communication open. Words like pluralism and tolerance are the abused bywords of modern liberalism, but these virtues, when properly understood as humility, patience, and respect, ought to be embodied by all parties in our public discussion, and are sadly lacking on both sides of the aisle. Even more, Christian citizens need not only to repent for lacking these virtues in our own public discourse, we need to model them in order to be the change we want to see in society. 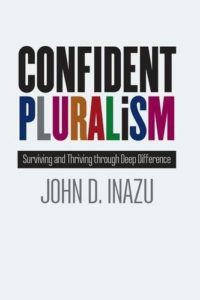 These virtues are not weakness – we need to be confident that they are the right thing to do in order to create a true and kind society – hence the book’s title – confident pluralism.